Following last week's blog about the inspirational work of Etel Adnan currently on display at London’s Serpentine Sackler Gallery and her painterly tapestries, we sought out some bright designers who are creating painterly furnishings and objects for the home. These items are perfect pieces to add artistic charm to your home and lovely additions to an art-lovers room! We'll often take inspiration from works of art for our interior design projects and love the idea of introducing painted ceramics, rug designs based on paintings and art-inspired furnishings. First up … Aino-Maija Metsola is an illustrator and print designer from Finland. She works as an in-house designer for print powerhouse Marimekko, designing prints for clothing and interior textiles. Metsola also created the ‘Weather Diary’ prints for their plates, tea bowls and cups. We love this collection as it was inspired by natural elements; the Finnish weather and shoreline. Metsola drew the designs in watercolour and ink, focussing on rain, clouds and grass fields. These bowls and cups would look lovely set against crisp, white linen and fresh cut white flowers, to create an elegant and charming table. The collection is available to buy from a number of UK stores including Heal’s. 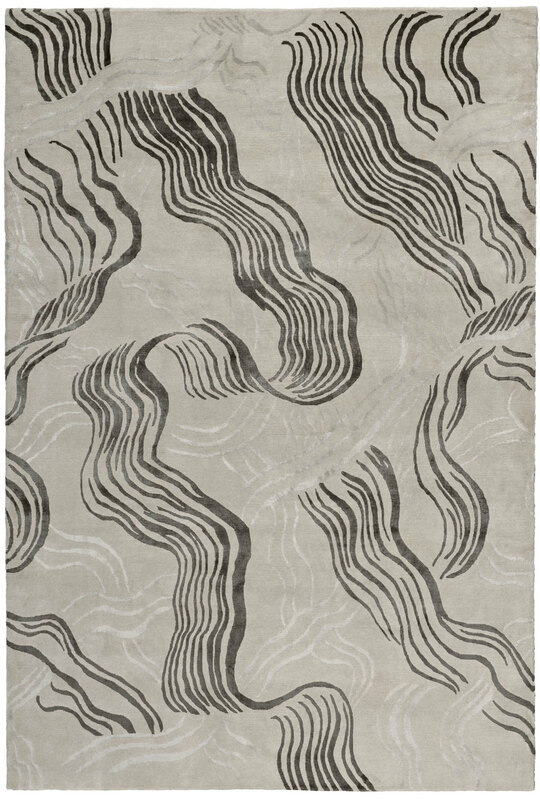 Kelly Wearstler’s collection for The Rug Company is another beautiful collaboration. Her hand-painted designs have been crafted into a series of rugs, each handmade by skilful specialist weavers in the Kathmandu area. ‘Wake’ shown below left draws inspiration from the free and fluid movements of water, creating an elegant and subtle design which would look lovely in a contemporary setting with a subtle colour scheme. Wearstler’s ‘Graffito’ design on the right is inspired by her love of graffiti and street art. The combination of a painterly, raw brush stroke design and pale blue colouring create a beautiful balance. 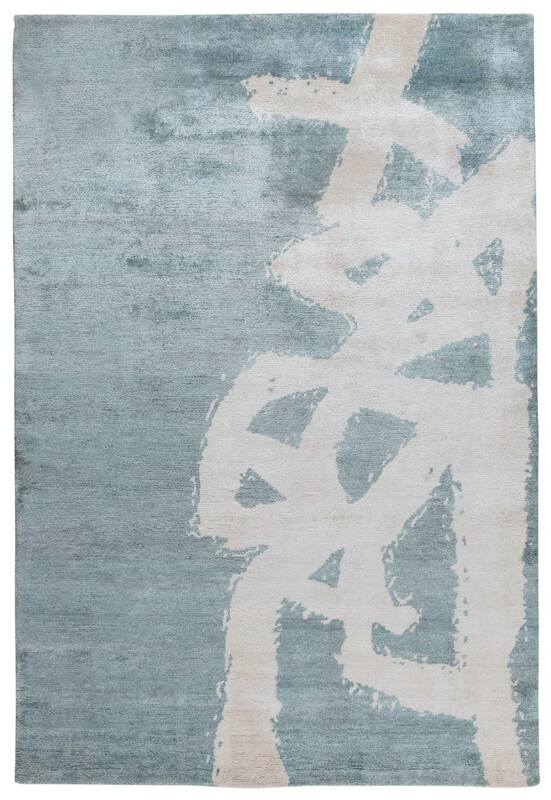 Wearstler's design below, named 'Flaunt' also draws on the fluid movements of water and includes bursts of sheeny blue to enliven the rug's surface. London based, Australian designer Amy Sia creates beautiful hand-painted designs for textiles and clothing. For Amy, accessories act as a canvas, and and each design is an artwork. Her passion for colour is evident in her bright textiles, their boldness is offset with her sensitively drawn designs - Sia's floral-like patterns particularly caught our eye. 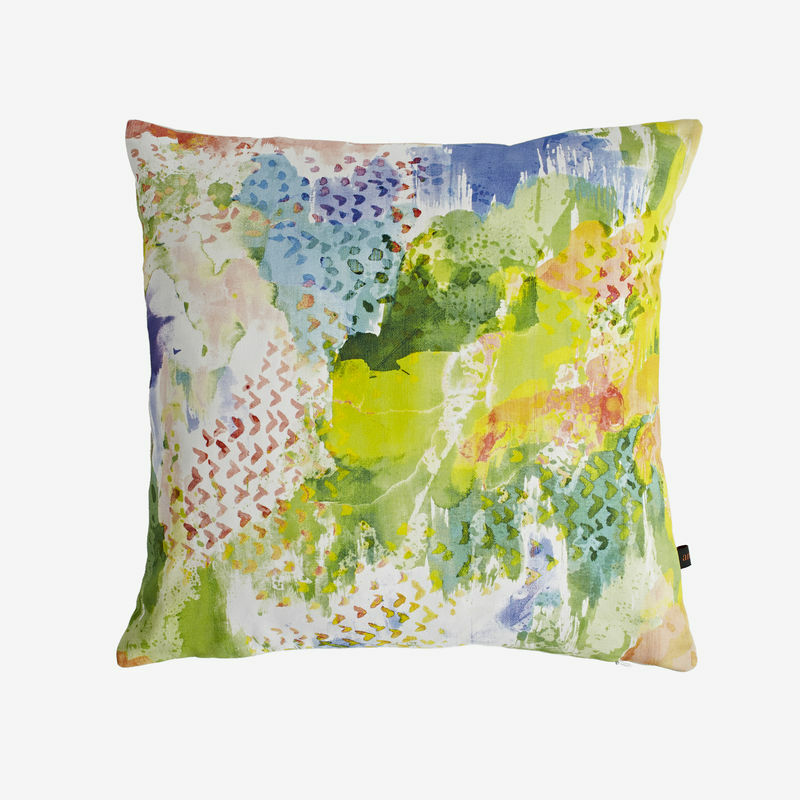 Like Metsola, Amy Sia’s designs are first drawn in watercolour and then transferred digitally onto handmade cushions, seen below. Visit Amy Sia's website to see more.